In Silver with black chequer plate and half leather trim in black. 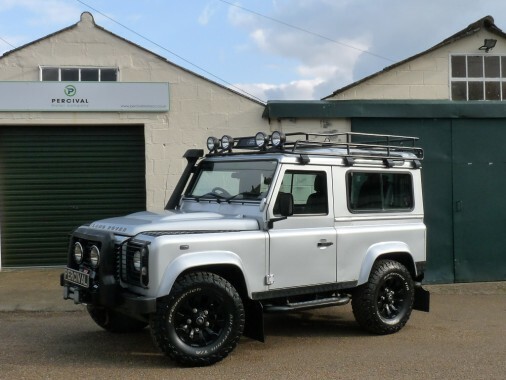 This Defender XS comes with a factory 4 tonne winch and A bar with spotlights, a factory snorkel, a full factory roof rack with spotlights, later Sawtooth alloy wheels in black, black chequer plate, an upgraded stereo with big speakers along with the normal XS air conditioning, heated seats and front screen and electric windows. The engine is the 2.4 unit with a six speed gearbox and the Land Rover has covered only 43,000 miles since new which is backed up with a full service history. The private registration number RFZ 111 will stay with the car.